These go from today, Black Friday, through the end of Cyber Monday... or as long as supplies last (as there are limited quantities, I've been told). P90X - this program is great, but I wouldn't recommend it for a beginner. 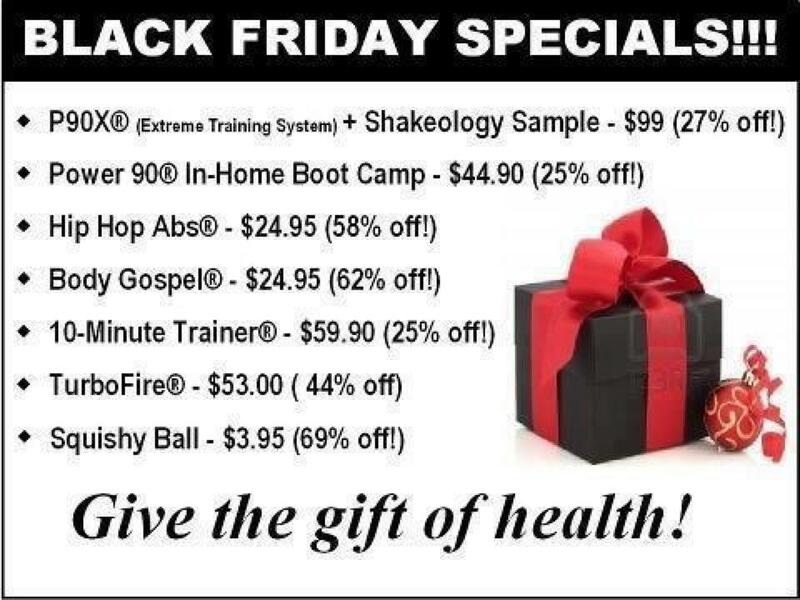 It's a great present for someone who is already active, but wants to take it to the next level. It combines strength, cardio, and yoga... you need approx. 1-1 1/2 hours per day, 6 days per week, to do this program properly for results. I love it, but I know it's not for everyone. Power 90 - this is a great program for beginners (in fact, it's where I started). It's also done by Tony Horton (like P90X). To get great results with this program you'll need approx. 45 minutes 6 days per week, but you can also ease in by starting at 2 days per week or 4 days per week (I can help you outline that if you decide to want to do it, just email me and I'll help!). This is perfect for the beginner exerciser. Hip Hop Abs - this is a fun, dance based, program that can be used by beginners to ease into exercise. It can also be used by people who already exercise who are just looking for some fun, dance based, videos to do at home. It's also created by Insanity creator, Shaun T. I use these on those days where I don't feel like exercising, but I'd be up for doing something fun (that I can laugh at myself while doing, since I have no rhythm). Body Gospel - this program is designed for beginners, and features gospel music. This would be a perfect gift for a beginner exerciser who is also quite religious, or could even be great for your church and getting a little exercise group or fit club started with your congregation! 10 Minute Trainer - this program is designed for beginners, but I honestly think the ab DVD is rather intermediate. It features a series of 10 minute workouts that can be stacked to give you anywhere from a 10 minute workout to a 60 minute workout. It comes with a scheduling calendar to help you get maximum results. Squishy Ball - this is an accessory that was designed to go with the Yoga Booty Ballet program, however it's great for holding between your knees during ab work, and also for use with physical therapy (I gave one to my mom to use with the exercises her physical therapist gave her). Stay tuned for more Holiday fitness shopping ideas! Next week I'll be posting my Holiday Fitness Guide of DOs and DON'Ts when buying someone a fitness product, program, or membership for the Holidays. Happy Shopping!